Nevermore is an American metal band from Seattle, Washington. Their precise musical style is debated by fans and critics alike. The band incorporates elements from styles such as Doom, Thrash, Power, and progressive metal into their songs, and also makes use of acoustic guitars and a wide range of vocal styles. They started in the beginning of the 1990s, when the band Sanctuary was pressured by its recording label to change its musical style, switching from heavy metal to grunge, which was obtaining mainstream success at the time due to bands such as Nirvana and Pearl Jam. 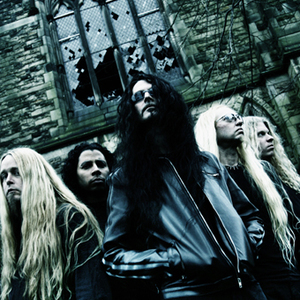 By the end of 1994, the band assumed a stable line-up, which saw the additions of drummer Van Williams and former Sanctuary touring guitarist Jeff Loomis . In 1995 Nevermore released its first, self-titled, album through Century Media Records. This album received much attention and specialized review, as its release was followed by an European tour with Blind Guardian and a North American tour with Death, both internationally-renowned bands. Their fifth album, "Enemies of Reality", remained in production for over a year, and was released in 2003. This album faced much criticism for its production and was re-released in 2005, after being remixed by Andy Sneap. On tour, the band was joined by second lead guitarist Steve Smyth , formerly of Vicious Rumors and Testament; Smyth was eventually added to the line-up on a permanent basis. According to the Official Nevermore website, www.nevermore.tv, their show on September, 12 2006 at the Zeche club in Bochum, Germany was to be filmed for Nevermore's first full length DVD. This event was captured by 7 cameras and the live recording was produced by Andy Sneap. The double DVD set includes a Nevermore documentary, all of the bands promo videos and past recordings from their whole career to date. This DVD was expected to be released in early 2007, but was pushed back and eventually came out the following year (2008). In August 2007, Steve Smyth stated that he will be parting ways with Nevermore. He is currently promoting his solo album that was recently released, The EssenEss Project. 2007 was a slow year for Nevermore as Warrel Dane, Van Williams and Jeff Loomis all worked on their own side projects for a good part of the year, only taking time off to do various festivals and a small tour. Nevermore released The Year Of The Voyager in 2008. In late 2009 Nevermore entered the studio with Peter Wichers to record their seventh album The Obsidian Conpiracy. It was released May 31st in Europe and June 8th in America. They also completed their line-up with the addition of Hungarian Guitarist Attila V?r?s. The Obsidian Conspiracy is also available in a limited edition box with a CD ROM titled Shed Like Loomis (featuring sheet music and guitar tabs and videos of Jeff Loomis playing guitar for two of the new songs), postcards featuring artwork and lyrics, and a digipak version of the album with two bonus cover tracks (The Tea Party's Temptation, and The Doors' Crystal Ship). On April 21 2011, long time and founding members Jeff Loomis and Van Williams announced their departure from Nevermore citing personal and musical differences.